The logging of rosewood is a very sensitive issue in Madagascar. According to Global Witness and the Environmental Investigation Agency (EIA), a dozen private operators and three main companies are benefiting from illegal logging in Masoala, while three banks facilitated the illegal timber trade. China is one main destination. (more details and references in the Masoala rosewood illegal logging case in the Atlas of Environmental Justice). On July 21st, Jean-Luc Rahaga, publication director of the national daily “Madagascar Matin” and its editor, Didier Ramanoelina, were suspected of “libel and press offenses” and jailed in Antananarivo. They were arrested because they published a letter from a reader who accused three members of the Government to be directly involved in the rosewood traffic – including the Minister of infrastructure, Rivo Rakotovao. The arrests came after the Minister complained. After a trial held behind closed doors on July 23rd, it became clear that the two journalists risked six months to two years in prison and the newspaper one month suspension of publication. 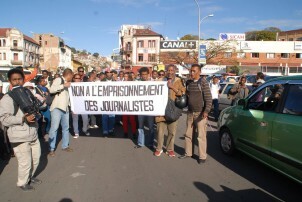 More than fifty journalists demonstrated outside the Court and in the streets of Antananarivo to protest, qualifying the arrest as a return of dictatorship. The environmental justice organisation Alliance Voahary Gasy (AVG), which is highly involved in exposing the illegal logging of rosewood in Madagascar, also supported the prisoners. According to AVG’s Coordinator, Andry Ralamboson, “The Malagasy Justice has taken a disproportionate decision contrary to the Criminal Code in which preventive detention is an exceptional measure”. Meanwhile, none of the barons of this illicit trade, whose names are known for many years, has ever been questioned. To defuse the growing protest, President Hery Rajaonarimampianina intervened publicly to disapprove “the imprisonment of journalists for acts within the scope of their profession.” Immediately after that declaration, the Minister withdrew his complaint. Despite the release of the two journalists, media in Madagascar are concerned about the future of press freedom in Madagascar and environmental civil society and public opinion are waiting for a real punishment of rosewood traffickers whose names were published by the Environmental Investigation Agency (EIA) and Global Witness in 2009.